Loose Cotton Polishing Mop Wheels - For Bright And Mirror Metal Finishes. 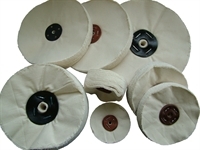 Applications: Loose cotton mop wheels are best used as the final stage of the polishing process for the final 'lift' to a mirror bright finish. They are most commonly used with the PV102 and PV05 polishing compounds. The traditional method of measuring polishing mop widths is in 'sections'. One section is approximately 1" in width on loose mops, although loose mops will splay out from their compressed centres. For guidance on max diameters to use on your machine, please tick the 'More Information' tab. Also Available: We supply suitable polishes for bright and mirror finishing metal when using loose cotton mops.